Health & Digestion is a Complete Food for Adult Dogs. Feeding Guide The quantities below are meant as a rough guide. The correct amount of food will defend on your dog's level of activity, breed age and if they are overweight or underweight. Fresh drinking water should be available at all times. Small Dogs (1-10kg): 22-130 g/day, 90-15 meals/bag Medium Dogs (11-25kg): 130-250 g/day, 15-8 meals/bag Large Dogs (26-45kg): 250-425 g/day, 8-4 meals/bag Giant Dogs (45kg+): 425 g/day, 5 meals/bag Number of meals based on 2 meals per day. 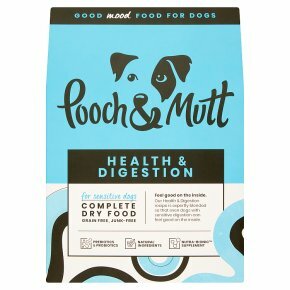 When switching dog foods it is recommended that your introduce the new food gradually replacing. 25% of their existing food for the first 2-3 days. Then 50% for a further 2-3 days, then 75% for a final 2-3 days calorie content 328.25 kcal/100g see website for puppy feeding guide. For canine use only. It is produced in an establishment where grains etc maybe present, so there is a tiny chance that a tiny amount may have snuck in, but we do everything in our power to try and ensure that this does not happen.